This was a book saturated with holy surprises. For sure, the title seemed eccentric and I couldn’t be certain that it be worth reading. After I read several pages I was able to use my own “spiritual” GPS and locate, and understand the “lay-of-the-land.” There was a sense of reading something very fresh, and striding to keep up with Mikalotos. I discovered that I couldn’t wait for the next page, which is a great indicator. Imaginative and engaging. If this book transformed into a person, I would immediately invite him to my living room for coffee and a conversation. I would not hesitate. Plot and content wise–this is a narrative of a man’s journey to what is real. Especially in the spiritual realm of the truth, where it is best to possess what you confess. The book unfolds with adventure after adventure. It has a plot that seems like sci-fi. It is both exotic and friendly, all at the same time. If I could think out loud my impressions of “Imaginary Jesus” in a single word it would be “winsome.” Mikalatos presses into our imaginations a journey that is both amusing as it is cutting. It is a fun read, that is explosive and sure, it puts together for us an understanding of our own hearts in this generation. I purchased my book direct from Amazon.com for $10.19 USD. We have a built-in a deep, voracious hunger for God and nothing can change that fact. You will never find anything that will satisfy this craving. My lovely wife loves chocolate, and I love my lattes. But they absolutely pale in the light of Him; there is no comparison. Fact #1, we were made to walk with God. Life unfolds before you, and your life has a definite purpose. Fact #2, God wants to connect you to himself. In the Garden-of-Eden days, Adam and Eve had this incredible relationship with him. The Bible tells us that God desired to “walking in the garden in the the cool of the day.” He has not changed. He wants to go hiking with you! Some of us who are reading this suffer from mental issues. Others struggle with broken relationships and divorce. There are those who deperately live out of their physical difficulties, illnesses and addictions. 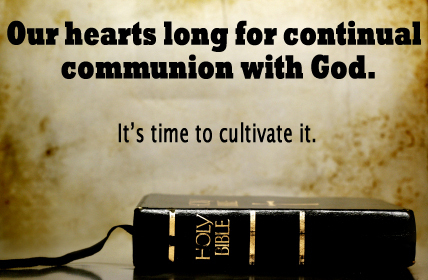 I invite you to consider a life with God through Jesus. Fact #3, your load will not be any lighter nor your path less challenging. But walking with God will fufill your dreams of purpose and meaning. His love and forgiveness can surround you and give you a new life. It would be a honor to help you make this step.